The Symphonic Band has the distinction of being the band program's top symphonic ensemble. Its select mission is to provide instrumentalists with an opportunity to demonstrate and develop the techniques and musical instincts appropriate to a symphonic setting. 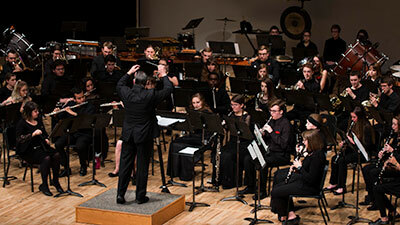 With an emphasis on the distinctive characteristics of the large wind and percussion ensemble, the Symphonic Band's repertoire is culled from the rich resources of the wind band tradition. The objectives of the Symphonic Band are to rehearse and perform repertoire of a symphonic nature, including high-quality transcriptions, large-scale works, and the best pieces composed for more than one player per part; to develop and nurture the fundamental skills necessary to perform repertoire of the highest caliber; to actively involve students in the creative process through commissioning projects; and to motivate and inform music educators and aspiring teachers through innovative programming, skillful rehearsing, and inspiring performing. Contact Anthony Falcone for additional information.